This Eichelberger Family History appears here courtesy of J. ‘Allie’ Eichelberger’s daughter, Katy Eichelberger Gallagher. Azure, or blue, signifies loyalty or truth; it was the color devoted to the Virgin by the Roman Church. Acorn is the fruit of the Oak, which holds first place among trees, signifying antiquity and strength. Acorn, in the Germain language is Eichel. Leaves are the emblem of truth. Vert, or green signifies hope, joy, and, loyalty in love. Argent, or silver or white, signifies peace and sincerity. The Eichelberger family the writer describes descended from those ancient Germans of whom the Encyclopedia Brittanica says: “In stature they were tall and vigorous, with long fair hair and fiercely blue eyes. Their dwellings were wooded huts, and war and chase were the favorite occupations of the men. Although violent and cruel in moments of excitement, they were rarely treacherous, and in ordinary life they appear to have been kind and considerate. Some of these rough traits my be noticed in the Pennsylvania German character even at the present day; but also their bravery, their religious devotion and their attachment to home and family. They greatly cherished the memory of illustrious ancestors and often listened with delight to songs delebrating their famous deeds.” This final trait may be the inspiration which brings one to write his own family history. Our German ancestors are recorded early in history. In St. Gallen in the German section of Switzerland is a monastery built around 1197 AD, and it has records of all born in St. Gallen. There is quite a list of Eichelbergers, and during the Reformation, in the 16th Century, the Eichelbergers fought among themselves. Such was the internal turmoil created by this dissension that the Eichelbergers were ordered out of St. Gallen. The Catholic Eichelbergers, known as workers of wood, went down into Austria. The Protestant Eichelbergers, known as men of arms, went across Lake Constance and up the Rhine River Valley. It is reported that during World War II some servicemen from Saxton walked along Eichelberger Strasse and Eichelberger Stadtpark (park) in Heidelburg, West Germany. It is firmly entrenched in tradition that our Eichelberger ancestors, for whom liberty was dear, frequently longed for a country across the oceans where religious freedom would be theirs. It is no wonder they emigrated to America in such numbers. Rupp and Kapp record that “in 1709, between the middle of April and the middle of July, the number of German Protestants that came to America, by way of London alone, was 11,294.” Other forces of human consideration deprived German citizens of a satisfactory life at home and, to the energetic and committed, only emigration afforded them relief. In early days all surnames were given or chosen for a family or clan, either for the meaning or the name or derivation, or bearing upon family residence or occupation. In 1900 in Hanover, Pennsylvania, Abdiel Wirt Eichelberger published a book entitled The Eichelberger Family Record 1693-1900, which detailed the early immigrant Philip Frederick Eichelberger. In the book Captain Eichelberger states, “after some study over the matter, I have come to the conclusion, that in our case there must have been, according to the church records at Ittlingen (Germany), as well as the fact of our having found other Eichelbergers of different descent than ours, a very large clan comprised of many families of Eichelbergers. Now the heads of each of these households most likely had a name which bore some relation to this occupation. 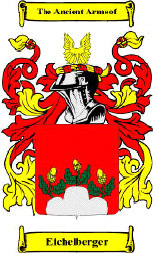 But the name borne by the entire clan, related to the situation of their family homestead or castle. It translated thus: Er-he or they: Eiche- oak: Berg- mountain: the letter “L” is apparently used only for the sake of euphony. “The Eichelbergers”- they are the mountain oaks, a name suggestive of strength and tenacity. Some advance the theory that the family home, as by translation of the name, was near the Black Forest. In an interesting notation occurring in the 1900 book, the writer states that in the correspondence he received from the Burgess of Ittlingen, “in the old town records he has found vouchers given to Eichelbergers, early in 1600, for quantities of wood delivered to the town.” This would make one think that our ancestral home was out upon the wooded mountains, as given in the translation above. One of our ancestors left a note that states our early ancestors came from Germany, from a town called Ittlingen. That same town is the origin of A.W. Eichelberger’s earliest ancestor quoted from above. Whether our source is correct, or based on the judgment of an earlier genealogist is uncertain. It is interesting that A.W. Eichelberger, in tracing his ancestors to Ittlingen, learned from the Burgess in May of 1887 that the church records of the Evangelical Congregation, while revealing numerous Eichelbergers recorded births, marriages, and deaths, in the year 1732 the name Eichelberger disappears from the birth and baptismal records, and it no longer appears after 1744. Consequently one could surmise that by 1744, no Eichelbergers were left in the town of Ittlingen, and all must have emigrated, or perhaps moved to other communities in Germany. All the records of Eichelbergers appear in Ittlingen earlier than those dates. This writer’s sources including his grandfather’s cousin Cora Eichelberger, our family’s earliest genealogist, identify Ittlingen as the ancestral homeland of the original Eichelbergers which we believe began the clan known as the Eichelbergers living in Ittlingen at the time of his correspondence with A.W. Eichelberger, or 1887. For historians in particular, Ittlingen is situated in the Barony of Gemmingen, as it was described at the end of the nineteenth century. The Philip Frederick Eichelberger of whom the earlier genealogist wrote, was born April 17, 1693, the son of John and Maria Barbara Eichelberger of that German town. Philip came to America on the ship Albany, leaving Rotterdam, Holland, on June 22, 1728 and arrived in Philadelphia on September 4 of the same year. Philip is documented as progenitor of the many Eichelberger families of Baltimore, Harrisburg, York, Lancaster, Lebanon, Hanover, and Frederick. We, the Bedford County Family, find no direct tie between our ancestors, Jacob, Christopher and Michael, and the Philip Frederick of Ittlingen. As immigrants landed in America and established themselves in countless cities, villages, and homesteads, their families grew and spread and became difficult to effectively trace. The idea of tracing an early family through several generations is an awesome task since so many descendants moved, relocating into various parts of America, and our nation grew so large and expansive as to absorb people into almost anonymity throughout. Additionally, in earlier times records were rarely maintained in accurate manner and to follow the migratory patterns of our ancestors requires examination of census documents, dated tax records, last wills and testaments, and land surveys and transfers for clues to relationships among people. In book by Halberts, incorporated, published in 1982, it is stated that Pennsylvania is the state most populated by Eichelbergers, with 277 households by that name. There are Eichelbergers residing in 46 of the 50 states, plus the District of Columbia. None appear to live in Nevada, New Hampshire, North Dakota, or Vermont. It was determined by Halberts that 1,504 Eichelberger households were in the United State in 1982, this based on telephone directories, city directories, and other miscellaneous public listings. A book of this nature cannot be developed alone. It requires the contributions of many family members who describe their own family units, their early family backgrounds, and share family trees, dates and residence information about their relatives. Early work on the Eichelbergers of Bedford County was conducted by Pauline A. Rees of Saxton, who gathered information during the 1930’s and early 1940’s. Much of her work cornerstones this record. Many interesting letters were sent to the writer by Mrs. Mildred ‘Mid’ Weaverling of Saxton, she was formerly an Eichelberger. Countless others shared glimpses of our ancestors through notes, letters, anecdotes, references to family Bibles, and stories of tradition and hearsay. The several maps appearing within were reproduced from F.W. Beers County Atlas of Bedford, PA (1877). To all these kind folks we owe a debt of gratitude for their contributions. This has been a work of many years, and is still unfortunately imperfect. Many branched of the family have moved afar and lost contact with others. Some have truly died out. Following the female branches has been arduous at best, however equal in importance to true genealogists. Because family records of this type are comparatively rare and the research required is fairly exhausting and expensive, it makes sense to maintain and update this document as new and illuminating evidence becomes available. Room has been left for extemporaneous notations by individuals keeping this book current. It is hoped that owners of this book will continue to document family growth and changes, plus new information discovered during future years. This writer welcomes information on the family and invites contributions of additional data relevant to the Eichelbergers. Hi. My name is Connie Fyfe. I had ancestors by the last name of Echelberry, in Ohio, that went there from Pennsylvania in the late 1700’s early 1800’s. Do you think that Echelberry is a variation of Eichelberger? It is said that the Echelberrys were German/Swiss. Thank you for your fabulous work. Very well could be. I know i have some in my Ancestry Tree that branch out to General Robert L Eichelberger from Urbana Ohio that is my 5th cousin. You have any names to see if i can link them to this group of Eichelbergers? Hello, I’m not aware of the Eichelberry name being linked, but many spelling variations are found in ancestry records. Hello my name is Jennifer Eichelberger born in Eureka Califorina. I have resided in Nevada, Utah, Wisconsin and Washington. My boyfriend and i plan on visting Eichelberg Germany within the next few months. I am interested in dialogue and finding out if we are related.